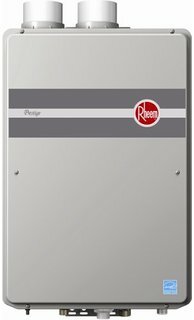 Tankless water heaters are undeniably practical but if you are seeking something considerably more practical and economic then you might want to take a look at under sink water heaters. These mini water heaters, just like the name indicates, go under sinks, under counter, or in bathroom closets which makes them much more compatible, but that’s only the tip of the iceberg. They are usually located near the water outlet which saves a lot of water that would usually go to waste while waiting for the main water heater to kick in. They come with tanks or tankless for convenience. They save the extra installation expenses that go into long pipes, lines or pumps. It reduces your heating cost which can save you up to a $100. They are compact, light and small which saves up a lot on space. They are easy to install as they come with quick installation guides. They can be mounted to walls or settled on the floor. 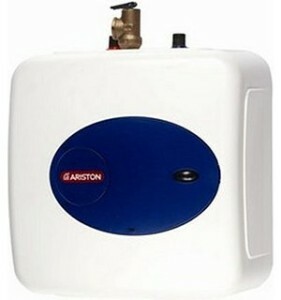 First name is the Bosch GL4S Ariston which is a powerful mini tank water heater (4 Gallons). It goes without saying that Bosch is a reputable brand, especially when it comes to water heaters and that is a great motivator to trust this product. Nevertheless, if that isn’t enough then let us take a closer look at the true potential of this unit. Bosch water heaters are known for being excellent machines and this one might just be the best under sink heater. You might think it’s an overstatement but this ‘point of use heater’ can provide instant hot water through your sink’s faucet. Also, forget about hard wiring because you can simply plug the heater to an outlet and voila. 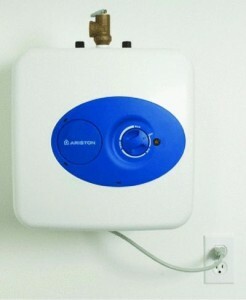 This mini tank water heater is electric which makes it even simpler to install and use. What is even more delightful is that you won’t have to let water go to waste while waiting for your distant water heater to kick in. The Bosch heats up your water instantly and that is something you will appreciate. 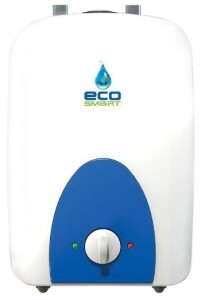 Moving on, we have the Ecosmart mini 6 electric mini-tank water heater. The title pretty much says everything about this next heater or does it? 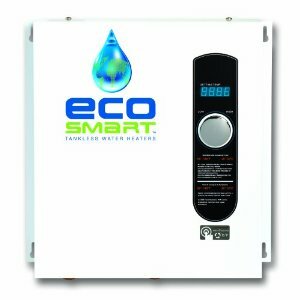 Well, Ecosmart is also a reputable name in the industry and it makes excellent tankless water heaters of all sizes and that gives a lot of legitimacy to this model. 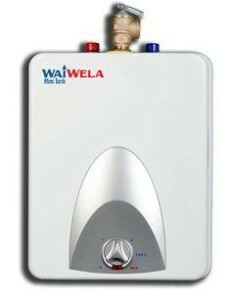 This point of use water heater comes in 4 models with 4 different tank capacities. You can choose between 1 gallon, 2.5 gallons, 4 and the 6 gallons heater, giving you a variety of choice depending on your needs. Just like most under sink heaters, the Ecosmart is easily installed, small/compact and doesn’t require a whole lot of hard wiring. The Ecosmart is a strong competitor and with a 6 gallons tank, it is also very accommodating for extra use, meaning you won’t be running out of hot water easily. Personally, I think that a heater with these characteristics and that brand can easily be the best under sink water heater. Second on the list is also a Bosch that goes by the name of GL2.5 Ariston. However, this unit is slightly smaller than the previous one as it can only handle 2.5 gallons at a time, but it’s still perfect for a single sink. On the other hand, the size of this mini water heater makes it extra compatible and will go unnoticeable under your sink, so you don’t have to worry about making space for it. Still, space saving is not the only perk of this under sink heater for it can heat water much faster due to its small size. Also, this Bosch can work independently or in line with a larger water heating system. What that means is that you can connect it to your principal heater and it will make the whole heating process much faster but then again, what would be the point of getting this heater. Nevertheless, the GL2.5 can still compete for the best under sink water heater trophy or even win it, depending on your preferences. Number four on the list (in no specific order) is the Waiwela WM-2.5 which is obviously a 2.5 gallon mini-tank water heater but what about the brand? Well, for many products, a trusted name can make it a lot easier to make the purchase which makes unfamiliar names a lot harder to trust. Nevertheless, although unfamiliar, Waiwela has a long history in the field of water heating and specifically pools. That being said, we now know that Waiwela didn’t just jump into being out of nowhere but it has risen from a similar background and that assures me that they know what they’re doing. The mini water heater at hand is also compact and space efficient but most importantly, it comes equipped with an adjustable thermostat with overheat protection to make sure you get the temperature you’re aiming for. Also, it is glass lined which makes it a lot stronger and a simple design that makes installing it a lot easier. 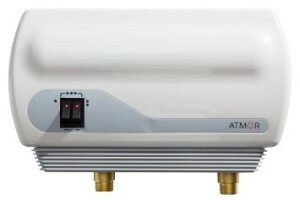 Under sink heater number five is the Atmor AT900-13 which is a point of use tankless water heater. This unit is indeed tankless which makes very convenient for a larger setting which can range from your sink to you shower if not more. On the other hand, this heater will require some wiring and a few other technical parts which demands hiring a licensed professional and that means more money. Nevertheless, this is a mini tankless water heater and that means a constant flow of hot water which cannot be attained with a mini-tank and that accounts for something. Also, the Atmor is even more space efficient (no tank) which makes it a lot easier to conceal in a bathroom closet or conveniently under your sink. This heater promises a flow rate of 4 gallons per minute which is admirable, coming from a unit this size. Also, the design is very simple and user friendly and with only two buttons, I don’t see how you can go wrong. 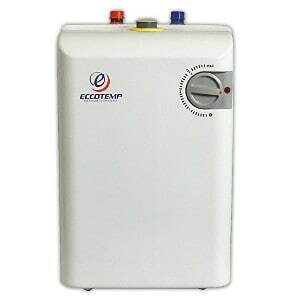 Last but definitely not least is the Eccotemp EM-2.5 which is an electric mini-tank heater and I know it sounds just like any other point of use heater but this one might just be the most powerful. This unit has an adjustable temperature control ranging from 50 to 140 degrees at your disposal, including a temperature/pressure relief valve. This heater however is designed to look like a standard heater which makes it slightly less compatible but it is still considerably small (14 x 11 x 11 inches). The Eccotemp has a 2.5 gallons tank capacity which should be enough for a single sink. So, don’t expect anything more out of this heater. Significantly, the EM-2.5 has one of the quickest recovery times and it ranges from 25 to 45 minutes for a full hot tank which is a fair deal of hot water.